Capacity and design: The Vinotemp 165 Bottle Single Zone Freestanding Wine Cooler is an attractively styled, relatively high capacity wine cooler for those wanting with a larger collection of wine in for which single zone storage is sufficient. This wine cooler is sleekly styled, primarily using black as its styling theme. The black bottle racks and black painted-wood faced bottle racks attractively complement the styling and black color of the unit. The VNTVT-165TSRV is rear-venting only, so it cannot be built in or put into a tight-fitting space. This unit features a Dual-pane glass door with recessed handle. A door lock is a standard feature to protect your collection and younger family members or visitors. Single temperature zone and UV protection: The temperature can be set anywhere in the range of 40°F to 65°F on an easy to use LED touch panel. The glass door provides effective UV protection for your valuable wines. Please note that as this is being written, Vinotemp is still waiting approval to be able to ship this product to addresses in California (doubly strange because Vinotemp is actually located in California but must wait approval from the California Energy Commission), so you should verify whether the product can be shipped to California if you are from that state. Accessible shelving and LED lighting: 14 sliding black wire shelves are both stylish and functional and have one larger open area for storing larger or odd-sized bottles, which can be a significant feature if you want to store more than standard Bordeaux-sized wine bottles. This cooler features attractive blue LED lighting both for the interior and of the touch controls and temperature display. Summary: This Vinotemp VNTVT-165TSRV 165-Bottle Single-Zone Wine Cooler (View on Amazon) is another excellent solution for moderate to larger wine collections using a freestanding unit. This Vinotemp features a single temperature zone and a quiet compressor. This large-capacity wine cooler has optional warranties lasting from 1 to 3 years. This unit also offer a wood veneer “wrap” that can make it match wooden furniture. 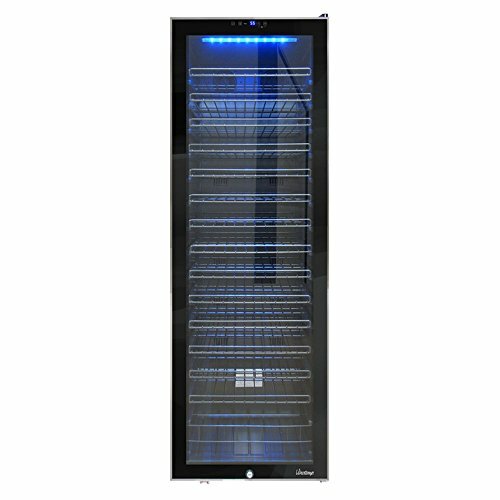 The VNTVT-165TSRV is a great choice in the freestanding large-capacity wine cooler category. These units are handmade in the USA. Vinotemp is a long-established company with over 30 years’ experience hand making their products in the USA.